The brake pedal load sensing switch is turned on when the brake pedal is depressed with force exceeding a predetermined level. 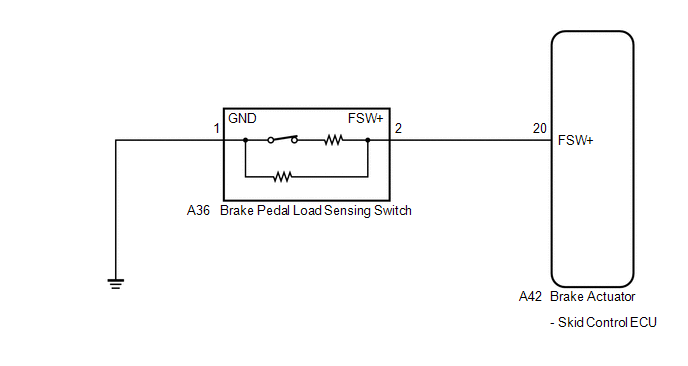 The skid control ECU detects if the brake pedal is depressed or not via this circuit. 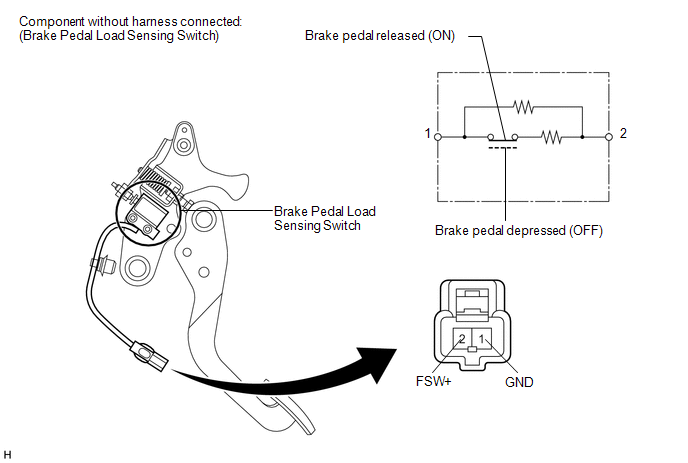 An open or short in the brake pedal load sensing switch continues for 0.3 seconds or more. Immediately after the ignition switch is turned to ON, the brake pedal load sensing switch is on and the stop light switch is off for 10 seconds or more. While the vehicle speed changes from 0 km/h (0 mph) to 30 km/h (18 mph), the condition that the brake pedal load sensing switch remains on occurs 5 times in succession. With the stop light switch on, the brake pedal load sensing switch off, and the master cylinder pressure 6 MPa or more, the deceleration is 0.4 G or more for 1 second or more. With the stop light switch on, the brake pedal load sensing switch off, and the master cylinder pressure 6 MPa or more, the vehicle speed is 0 km/h (0 mph) for 5 seconds or more. When C1249/49 is output together with C1267/67, inspect and repair the trouble areas indicated by C1249/49 first (See page ). (d) Check that the stop light switch display and brake pedal load sensing switch display observed on the Techstream change according to brake pedal operation. (e) Slowly depress the brake pedal, and check when the stop light switch and brake pedal load sensing switch turn on. First the stop light switch should turn on, and then the brake pedal load sensing switch should turn on. 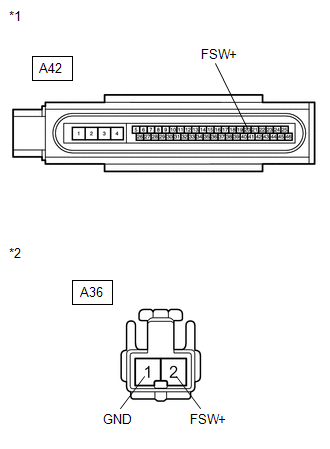 (c) Disconnect the brake pedal load sensing switch connector.